Try our Jacare Quartz Crystals Satisfaction Guarantee - compare our quartz crystal prices and our superior quality. 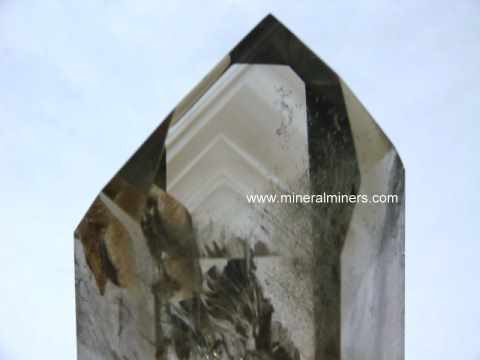 Select any natural elestial quartz crystal image to enlarge it. Extra Large Elestial Crystal with Gold Rutile! Elestial Quartz Measurements: 21" long x 15" x 11"
This amazing jacare quartz crystal (jacare quartz is also known as elestial quartz) makes a very beautiful decorator specimen! We have a sturdy welded steel stand that holds this wonderful smoky quartz crystal specimen securely in an upright position. The stand will be included at no extra cost. See a photo of this large elestial quartz decorator crystal resting on its display stand. This spectacular smoky quartz crystal has medium smoky brown natural color. It is semi-transparent with some areas of its surface showing natural golden rutile inside! See a close-up view showing an area of this elestial quartz with golden rutile. The recuperated tip is in excellent condition, and all sides and the lower portion have all natural surfaces with partial overgrowth form. The lower portion is partially terminated as well. 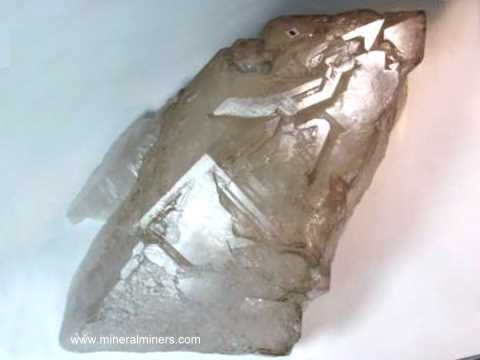 See a side view showing the lower portion of this large elestial quartz decorator crystal. Elestial Quartz Measurements: 3.7" x 2.2" x 1.7"
This specimen of naturally terminated jacare quartz crystal (also known as elestial quartz crystal) has light smoky brown natural color. It has all natural surfaces and it is semi-transparent with multiple stepped pyramidal terminations and multiple parallel prismatic faces on some surfaces with interesting geometric patterns and partial scepter overgrowth form. The prismatic faces and terminations have some minor abrasions and are in mostly good condition. There are hundreds of small mica crystals intergrown with this crystal's surface on one side and within the crystal in some areas. See another view of this elestial quartz crystal. Elestial Quartz Measurements: 3.2" x 2.7" x 2.1"
This specimen of naturally terminated jacare quartz crystal (also known as elestial quartz crystal) has light smoky brown natural color. It has all natural surfaces and it is semi-transparent with multiple stepped pyramidal terminations and multiple parallel prismatic faces on some surfaces with interesting geometric patterns and partial scepter overgrowth form. The prismatic faces and terminations have some minor abrasions and are in good overall condition. Elestial Quartz Measurements: 4.3" x 4.1" x 1.5"
This specimen of naturally terminated jacare quartz crystal (also known as elestial quartz crystal) has a few dozen semi-transparent green tourmaline crystals intergrown with the quartz. The quartz has naturally etched and re-crystallized surfaces with hundreds of tiny crystal points. It is semi-transparent. The naturally terminated surfaces are in very good overall condition. See a opposite side view of this elestial quartz crystal. See also a close-up view showing some of the green tourmalines in elestial quartz. Elestial Quartz Measurements: 4.3" x 2.9" x 2.8"
This specimen of naturally terminated jacare quartz crystal (also known as elestial quartz crystal) has medium natural smoky brown color. It has all natural surfaces and is semi-transparent with multiple stepped pyramidal terminations and multiple parallel prismatic faces on its upper surface showing interesting geometric patterns. The prismatic faces and terminations have some minor abrasions and are in good overall condition. There also is a small 1.5mm enhydro bubble moving back and forth within a 7mm long natural fluid filled inclusion. See a close-up view of this tiny natural elestial enhydro within its natural fluid filled chamber inside the crystal. Elestial Quartz Measurements: 5.2" x 3.5" x3.1"
This specimen of naturally terminated jacare quartz crystal (also known as elestial quartz crystal) has natural colorless to light smoky brown areas. It has all natural surfaces and is has transparent terminated areas with multiple stepped pyramidal terminations and multiple parallel prismatic faces on its upper surface showing interesting geometric patterns. The prismatic faces and terminations have some minor abrasions and are in mostly good overall condition. Elestial Quartz Measurements: 8.7" x 3.1" x 1.3"
This fine quality specimen of naturally terminated jacare quartz crystal (also known as elestial quartz crystal) makes a beautiful decorator specimen. It has light to medium smoky brown natural color. It has all natural surfaces and it is semi-transparent with multiple stepped pyramidal terminations and multiple parallel prismatic faces on some surfaces with interesting geometric patterns and partial scepter overgrowth form. The prismatic faces and terminations are in very good overall condition. See an opposite side view of this elestial quartz crystal. Elestial Quartz Measurements: 4.5" x 4.3" x 3.3"
This naturally terminated jacare quartz (jacare quartz is also known as elestial quartz) crystal specimen has an internal inclusion that is an open chamber within the quartz. There is a bubble trapped within the natural fluid in this chamber, and the bubble moves around some inside the liquid! This is popularly known as an elestial enhydro. This elestial quartz crystal specimen also makes a beautiful decorator specimen. It has light to medium smoky brown natural color in the semi-transparent quartz crystal overgrowth on the milky quartz base. It has all natural surfaces with partial overgrowth form. Most surfaces show some broken or abraded areas. See a side view of this elestial enhydro crystal. See also another side view of this natural specimen of elestial quartz. 5.9" x 3.3" x 2.6"
This naturally terminated jacare quartz crystal (also known as elestial quartz crystal) has natural light smoky brown color outside and light golden-yellow citrine color deep inside! This elestial citrine crystal is completely natural - it has not been heated or treated in any way. It is semi-transparent to transparent with multiple stepped pyramidal terminations and multiple parallel prismatic faces on its upper surface. The prismatic faces and the terminations have some minor abrasions and are in good overall condition with some broken areas on the back side. elextial Quartz Dimensions: 6.9" x 4.3" x 4.1"
This specimen of naturally terminated jacare quartz crystal (also known as elestial quartz) has colorless to light brown natural color. It has areas with very good internal transparency, with multiple stepped pyramidal terminations and multiple parallel prismatic faces. Its prismatic faces and terminations are in mostly very good condition. 9.7" x 5.6" x 2.6"
This beautiful specimen of naturally terminated jacare quartz crystal (also known as elestial quartz crystal) is semi-transparent to transparent. It has light to medium smoky brown color outside, with areas inside showing natural golden color making this a true natural color elestial citrine crystal! It has natural dissolution features on its surfaces with some multiple stepped pyramidal terminations and multiple parallel prismatic faces on its upper surfaces which are in mostly good condition with some abraded areas. Jacare Quartz Crystal Dimensions: 8.9" x 5.8" x 2.9"
This naturally terminated jacare quartz specimen (also known as elestial quartz crystal) is terminated on its upper surface by colorless to light smoky color elestial quartz crystal with very nice vitreous luster. The elestial quartz is semi-transparent to transparent with multiple stepped pyramidal terminations and prismatic faces that are in very good overall condition. There are numerous internal skeletal inclusions or cavities with interesting geometric patterns. One of these internal cavities has a bubble that moves back and forth inside. See also another view of this natural elestial quartz crystal. 12.75" x 10.5" x 5.5"
This wonderful decorator specimen of naturally terminated jacare quartz crystal (also known as elestial quartz crystal) is semi-transparent with transparent areas, and it has colorless to medium-dark natural smoky brown color. It has a relatively flat shape, and it was attached to other natural jacare elestial crystals on its back side. Its upper surface is covered with natural stepped pyramidal terminations and multiple parallel prismatic faces. It has numerous internal skeletal inclusions or cavities containing multi-colored clay minerals. Most of its terminations are in very good condition with very brilliant vitreous luster. 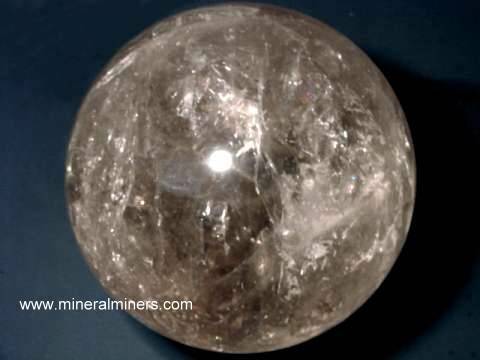 It contains a natural 2-phase inclusion (also knows as a quartz "enhydro") with a very easily visible 0.2" diameter bubble which travels back & forth within a fluid filled cavity inside the quartz! The gas bubble has been trapped within this natural skeletal quartz crystal since the crystal formed more than 50 million years ago! See also a side-view photo. See also another view of this naturally terminated elestial crystal. See also a view of another side of this unique large elestial crystal. Amethyst Mineral Specimen Dimensions: 7.3" x 5.5" x 4"
This is a rare natural color Brazilian amethyst specimen that is so dark it appears almost black! When a bright light is used, areas of rich dark purple are revealed as shown! The refinished tip is in very good condition. The photo at left is a top view. See also a side view of this dark amethyst elestial crystal. Amethyst Mineral Specimen Dimensions: 10.2" x 7.7" x 6"
Amethyst Mineral Specimen Dimensions: 9.5" x 7.5" x 6"
This is a rare natural color Brazilian amethyst specimen that is so dark it appears almost black! When a bright light is used, areas of rich dark purple are revealed as shown! The refinished tip is in very good condition. See also an opposite side view of this dark amethyst elestial crystal. Smoky Quartz Crystal Dimensions: 3.6" tall x 2.6" x 1.9"
This polished crystal of natural color elestial smoky quartz crystal has fine transparency with natural faint smoky phantom shapes inside, and it has light brown natural color. See also a close-up view showing the faint phantom shapes in this smoky quartz phantom crystal. Smoky Quartz Crystal Dimensions: 7.2" tall x 4.2" x 3.6"
This rare quality polished crystal of natural color smoky quartz has fine transparency with light brown natural color. 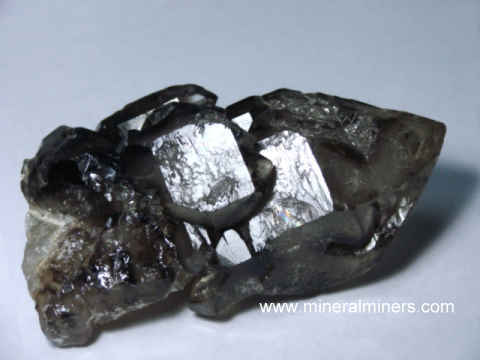 See also an opposite side view of this very clear smoky quartz crystal. Polished elestial quartz crystal weighing 3.5 pounds! Smoky Quartz Crystal Dimensions: 5.1" tall x 4.0" x 2.7"
This lightly included polished crystal of natural elestial quartz is transparent with light brown natural color. It looks amazing on a light box! Smoky Quartz Crystal Dimensions: 8" tall x 3.7" x 2.5"
This eight inch tall lightly included polished crystal of natural elestial quartz is transparent with light brown natural color. This beautiful crystal also looks very nice on a light box. Smoky Quartz Crystal Dimensions: 7.3" tall x 4.7" x 2.7"
This lightly included polished crystal of natural elestial quartz is mostly transparent with medium brown natural color. This wonderful crystal also looks great on a light box! Smoky Quartz Crystal Dimensions: 7.4" tall x 5.5" x 3.3"
This lightly included polished crystal of natural elestial quartz has good transparency with medium brown natural color. This large crystal looks amazing on a light box! This polished quartz crystal is mostly transparent, and it stands up 6.9 inches in its handcrafted wood stand. It was polished from a natural elestial quartz crystal mined in Minas Gerais, Brazil. This polished quartz crystal makes a very nice decorator mineral specimen. This polished quartz crystal is transparent with some colorfull rainbow reflections inside. It stands up 5.7 inches in its handcrafted wood stand. The quartz crystal has a tabular hexagonal shape and measures 5" x 2.5" x 1". The photo at left is a front view of this beautiful decorator quartz crystal. See also a side view of this polished quartz crystal with its wood base. It was polished from a natural elestial quartz crystal mined in Minas Gerais, Brazil. This polished quartz crystal is transparent and stands up 7.5 inches tall in its handcrafted wood stand. The quartz crystal has hexagonal shape and measures 6.9" x 1.8" x 1.2". Quartz crystal alone weighs 6 pounds! This wonderful decorator quartz crystal is mostly transparent and stands up 10.5 inches tall in its handcrafted wood stand. The polished quartz crystal has hexagonal shape and measures 9.3" x 4.2" x 3.3". See also an opposite side view of this polished quartz decorator crystal with its wood base. It was polished from a natural elestial quartz crystal mined in Minas Gerais, Brazil. This polished quartz crystal is semi-transparent to transparent and stands up 11 inches tall in its handcrafted wood stand. The quartz crystal itself has hexagonal shape and measures 10.2" x 1.5" x 1.1". This polished crystal of natural jacare quartz (also known as elestial quartz crystal) is colorless. Elestial Quartz Crystal Dimensions: 4.75" tall x 2.5" x 2.1"
This polished crystal of natural jacare quartz (also known as elestial quartz crystal) has very good transparency near the tip and becomes somewhat cloudy towards the base. It has light brown natural color with faint natural smoky phantoms inside as shown at left! See also a full front view of this elestial phantom crystal. Elestial Crystal Dimensions: 3.7" tall x 2.9" x 2.4"
This polished crystal of natural jacare quartz (also known as elestial quartz crystal) has very good transparency with very light golden yellow natural color. It also has several small but nice rainbow reflections inside. It looks amazing on a light box! See a close-up view of one of the rainbow reflections within this elestial quartz crystal. Elestial Quartz Crystal Dimensions: 5.7" tall x 3.3" x 2.6"
This polished crystal of natural jacare quartz (also known as elestial quartz crystal) is semi-transparent to transparent with medium brown natural color. This elestial quartz crystal has some smoky phantom layers inside. Elestial Quartz Crystal Dimensions: 5" tall x 3.2" x 2.4"
This polished crystal of natural jacare quartz (also known as elestial quartz crystal) is transparent with light brown natural color and several internal rainbow reflections. This elestial crystal looks fantastic on a lite box! 9.4" tall x 2.9" wide x 2.2"
This elestial crystal stands up 9.4 inches tall as shown! It was polished from a natural elestial quartz crystal mined near Diamantina, Brazil. This beautiful crystal is transparent enough throughout its length that you can just see your hand on the opposite side of the crystal when looking through it. Elestial Quartz Crystal Dimensions: 9.7" tall x 2.8" x 2.5"
This polished crystal of natural jacare quartz (also known as elestial quartz crystal) is semi-transparent with light brown natural color. There are multiple smoky phantoms inside the upper part of the crystal as shown in the close-up photo at left. See also a full view of this 9.7 inch tall elestial quartz crystal. Elestial Flame Crystal Size: 5.7" tall x 4.7" x 3"
This unique decorator crystal of jacare quartz (also known as elestial quartz crystal) was hand-ground and polished into this unique "flame" like shape. It has good transparency with light smoky brown natural color and some beautiful rainbow reflections inside. See a full view of this elestial quartz crystal. See also a side view photo of this flame shaped elestial crystal. Elestial Crystal Dimensions: 6.8" tall x 3" x 2.3"
This 6.8 inch tall polished crystal of natural jacare quartz (also known as elestial quartz crystal) is transparent throughout its length and has very fine deep orange-gold natural citrine color! This beautiful decorator quartz crystal has good transparency with several colorful rainbow reflections inside! The polished quartz crystal has hexagonal shape and stands up 12 inches tall in its handcrafted wood stand, and the crystal alone measures 11.2" x 2.6" x 2.1". See also an opposite side view of this polished quartz decorator crystal with its wood base. It was polished from a natural elestial quartz crystal mined in Minas Gerais, Brazil. This fine quality sculpture was carved by hand from a crystal of natural jacare quartz (also known as elestial quartz crystal). This hand-carved horse head has very good transparency throughout with light brown natural color. The quality of workmanship is excellent! See also an opposite side view of this hand carved quartz crystal horse head. Crystal measures 19" tall x 2.8" wide x 2.3"
This polished quartz crystal stands up 20 inches with its wood base! It was polished from a natural elestial quartz crystal mined in Minas Gerais, Brazil. It is semi-transparent to transparent throughout its length, and the quartz is colorless with over a dozen parallel phantom layers in the upper part of the crystal. See a close-up photo of the upper 10 inches of this amazing elestial quartz crystal. 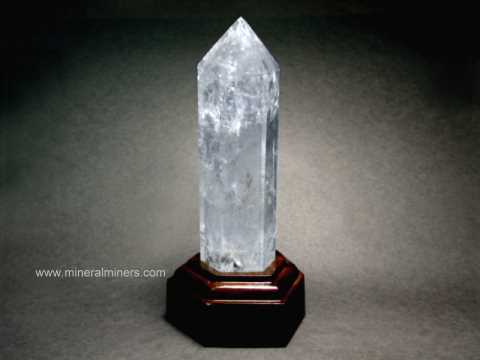 See also a full view photo of this 20 inch tall elestial quartz crystal. The handcrafted wooden stand will be included at no extra charge. 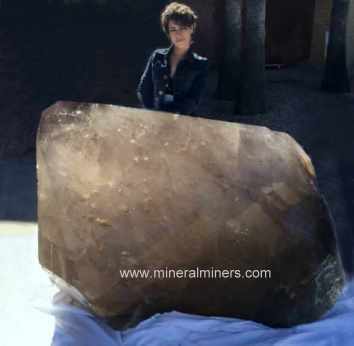 This polished elestial quartz crystal weighs 129 pounds! It was polished from a natural elestial quartz crystal mined near Diamantina, Brazil. This beautiful decorator crystal has areas with light to dark all natural smoky color. See also a back view of this giant elestial quartz crystal. This amazing crystal skull is very Large! It was carved by hand from a single natural elestial quartz crystal with colorless to very light brown natural color. This unique smoky quartz crystal skull is mostly transparent with some slightly more cloudy areas. See also another side-view photo of this genuine elestial quartz crystal skull. See a front view photo of this large life-size elestial quartz crystal skull. See also another view of this truly spectacular crystal skull. Our Jacare quartz crystals formed inside the earth. They were all mined in Brazil. See also some of our colorless natural quartz crystals. We have them available in a great variety of shapes and sizes. Our quartz clusters were all mined in Brazil. We also have many other kinds of natural quartz crystal mineral specimens. Many of our natural quartz crystals have flawless gem grade areas inside! We also have a phantom quartz crystals page, and our page displaying a huge variety of shapes and sizes in polished quartz crystals. We have a huge inventory of natural quartz crystal products, so be sure to let us know if you have any genuine quartz crystal requests. Each of our quartz crystal items is natural quartz crystal. We specialize in Collector Quality Quartz Crystal Mineral Specimens! Information about genuine elestial quartz crystal and its physical properties, chemistry, history, occurance, and metaphysical uses is displayed on our skeletal quartz information page. See also our quartz information page. To see more elestial quartz crystal photos, just select another Quartz image displayed below. To see photos of another quartz variety or other mineral variety, select any link in our Mineral Inventory & Factsheet Index. Would you like us to inform you when we add more natural jacare quartz crystal specimens on this page? We literally have tons of naturally terminated quartz crystal mineral specimens in stock at our mineral warehouses, so be sure to let us know if you have any special requests.